So, there’s the tantrums. And the screaming. The “Mine!”s and the “No!”s. The bazillion toys with annoying musical themes. There’s the feeding and the changing and more feeding and more changing. There’s the blowouts and the spit up and the adult-type vomit that begins at a much earlier age than you would expect. There’s the cleaning food off the walls and off the floor, out of the crevices of the couch, and strewn across every square inch of the car. There’s the wiping of snot off of faces, off of walls, off of everything. There’s the cost. Of formula. Of food. Of daycare. Of clothes. Of parties. Of braces. Of college. Of cars. Of housing. Of weddings. There’s the “Don’t lick the window!”s and the “We do not eat cat hair!”s and the “We don’t pee on the dresser!”s. And, for the love of all that is holy, there is the LACK OF SLEEP. And I hear it doesn’t get any easier when the kids get older. Maybe they don’t wake you with their cries, or their morning renditions of Elmo’s Song, but they still wake you, with the worries. Late teen/early twenty-somethings doing God-knows-what with God-knows-who on a college campus. The impending insomnia tires me out even more than the current insomnia does. That’s what really scares me. The exhaustion. But, there’s the cuddles. And the “Look at that!”s and the gasps of awe at observing something new, the quirky insights and the questions that make you think, even though they came out of the mouth of a human being that has been around for a shorter number of years than my current smart phone. There’s the laughter and the silliness and the finding happiness in the little things, every single day. There’s the joy that exists in me, that is multiplied exponentially when I see the same joy exhibited by them. There’s the comfort in the feeling of being a part of a whole. There’s the learning what’s important, from those teeny-tiny monsters, those miniature Buddhas-with-attitudes. There’s the being ridiculously happy just from watching them be themselves. That’s what really scares me. Missing learning and growing from a unique perspective, missing another eye-opening lesson about what life is really all about. 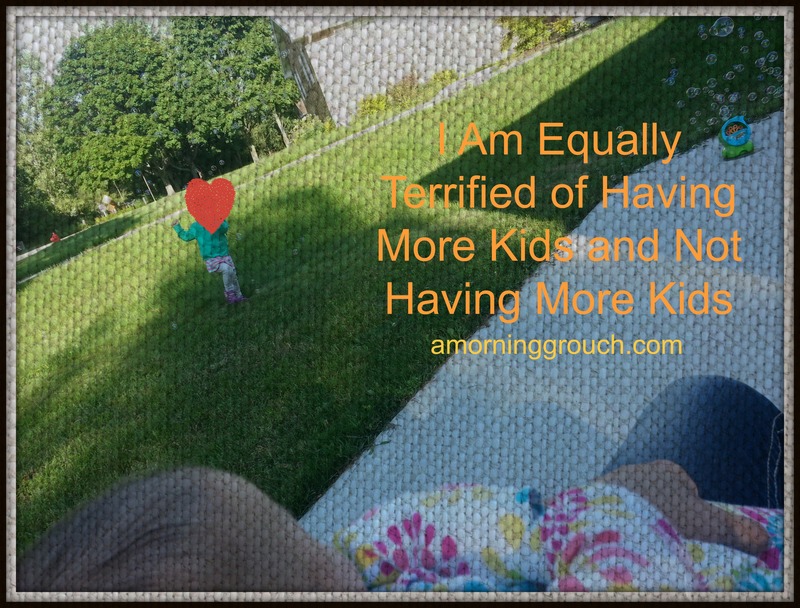 Now that I have two little peanuts, who are similar in the important ways, but who are already oh-so different in every other way, it makes me mourn for who else could have been. It makes me wonder who else could still be. The third one’s usually not a rational decision anyway – somehow it just happens, and everyone deals with it. That’s not to say that the third one isn’t loved every bit as much as the first two. And the good news is, by the time that third one comes along, you’re pretty good at figuring out how to raise him or her. well, if we didn’t have a kid by rational decision, I think i’d call it a miracle. haha. gah, i know…..but two you can do man to man defense! Rereading your two linked posts brought it all back, the journey to parenthood just so damned heartbreaking sometimes. And then we get the ones we dream of – and the little terror pulls off his nappy to poo on your bed (“Look Mummy! I made it for you!”), and messes up the words of songs until your heart’s so full it can’t hold any more love, and screams in the middle of supermarkets because you wont let him pull your top down, and cuddles you while stroking your arm and sucking his thumb… I think we know when we’re done with having more. And if we don’t know, then we’re not done. Beautiful post, thank you. haha yea. the ups and downs. i think we’re done unless we decide to aggressively pursue, which we can decide at any point, hypothetically. gah. I have no advice. I never gave birth even though I so wanted to back in my late 20’s. I married a man who had a little girl. hahaha so true. and i work with teenagers so eek. i so get it. yea, the feeling has to be STRONG, that’s for sure. When you say it makes you wonder who else could still be, it reminds me of a joke. The kid tells his parents, “I’m always in trouble, why did you even have me?” and the dad says, “Well…we didn’t know it was going to be YOU.” haha. You should have one more…. This is really how I feel most of the time.